As we approach 2018 there is an explosion of advancing technology made to make our lives easier, and while you may be excited for AI and self-driving cars it's also an excellent time to consider how this advancing technology could help you protect your property. 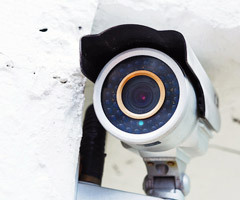 The latest CCTV technology has revolutionised how we protect our homes, with CCTV not only deterring crime but by ensuring that if something does happen that it is all caught clearly on camera. Higher Resolution - 1080HD now the main resolution on specs with consultants at 8-10ips. H.265 now utilised in the market. Fish Eye lenses and panoramic cameras are now used to capture the widest picture possible. IP cameras can be combined with access systems, alarms and more, in order to provide unified and seamless execution in areas of all sizes. Options to store footage to an SD card or via Cloud Storage. As well as IP cameras and surveillance we offer a range of alternatives such as PTZ cameras, External CCTV detection units, Digital video recorders and NRS and hard drive recorders. We work with you to see what best suits your property and create a security system that matches your lifestyle. If you have any questions about the latest CCTV technology or any of the other security systems we offer, don't hesitate to get in touch. Our team of experts can help you pick a security system that matches your exact requirements.